1) The P-2000 is an electrical resistance-type moisture meter,utilizing the relationship between moisture content and electrical resistance. 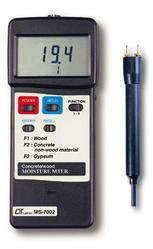 The contact pins mounted on the top ofthe meter are used for making direct contact with the material. Various external electrodes are also available for specific applications. The P-2000 is especially useful for testing paperboard, corrugated stock, and paper tubes. It is ideal for plant super intendents, inspectors, buyers, and sales people. Built-in calibration check.Averages up to 100 accumulated readings.Audible, adjustable alarm alerts Integral contact pins ,9V batteryBuilt-in connector for optional electrodes. 2). 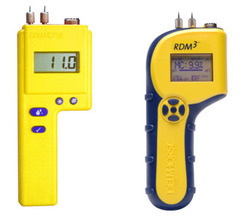 The RDM-3P is fully equipped for testing paper board,corrugated stock, and paper tubes using its paper scale,0-100 reference scale, and baled paper scale. Whatever the situation calls for, the RDM-3P delivers. Advanced storageand recall features make it easy to organize multiple jobs, oreven download data to a PC via the optional linkage software.The paper production industry has a new ally in the reliableand precise RDM-3P! A New Ally to Paper Products Bright, clear digital display. 8-40% MC – baled scrappaper. Integral contact pins Built-in connector for optional electrodes Audible, adjustable alarm alerts Auto-shut off timer,9V battery Store up to 1400 readings withdate & time stamp View stored readings on screen.Organize readings by job Optional software available to download data to a pc. species, then converter to the reading of % " Moisture of Content ". F1 ( Function 1 ) 6 % to 40 % moisture range on wood. F2 ( Function 2 ) 0 to 100% relative moisture value for Concrete and other non-wood material. F3 ( Function 3 ) 0.2 % to 50 % moisture range on gypsum. Circuit Custom one-chip of micro processor LSI circuit. Data Hold By push button on front panel. Memory Recall Records Maximum & Minimum reading value. Power off Auto shut off, saves battery life, or manual off by push button. Power Supply Alkaline 006P, MN1604 ( PP3 ) DC 9V battery. Main instrument: 180 x 72 x 32 mm ( 7.1 x 2.8 x 1.3 inch ).Moisture Probe: Round 23 mm Dia. x 165 mm. Digital intelligent MCU paper moisture Meter works on 3 types of paper(Carton, Art Paper (Copper plate paper), Writing paper ) by using the spring contact precise measuring. 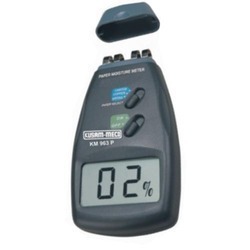 Looking for MOISTURE METER ?